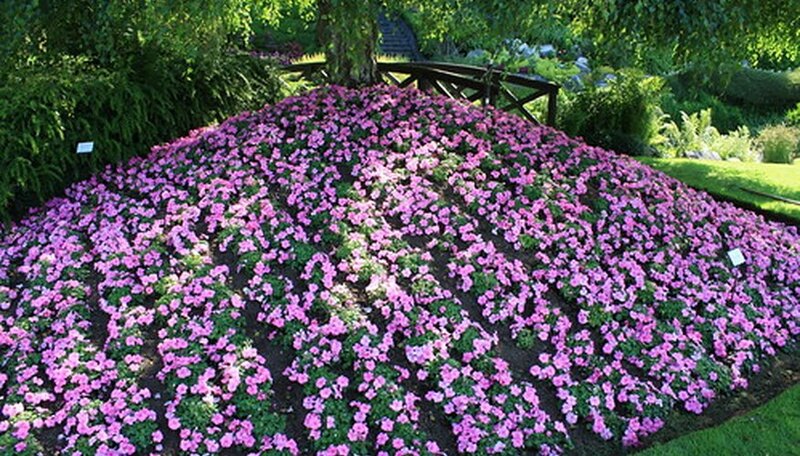 Impatiens are generally a low- to no-fuss annual that spreads rapidly and provides a splash of color in shady areas. But ants are sometimes attracted to impatiens, irritating gardeners and damaging plants. Manage ants by paying attention to your conditions and experimenting with organic methods of deterrence. Impatiens produce a sweet nectar that may attract ants. Ants may also farm aphids on impatiens. While ants are not cited as the most destructive or common pest for impatiens, their presence is sometimes a nuisance to gardeners. Consider whether ant population around your impatiens is large or troubling enough to invest time and energy in deterring. Sometimes, allowing nature to take its course is as effective as putting up a fight. Is there visible plant damage? Are impatiens and ants located where people often relax, such as near a patio? You may want to experiment with organic deterrents. Or perhaps you or your child have an interest in biology. In this case, an ant colony provides an opportunity to observe the insects' behavior at close range. Ants are difficult to control organically, while pesticides are harmful to the environment. Before you apply chemical controls for ants to your impatiens, consider the health of the planet. Try organic methods of ant deterrence. Sprinkle cinnamon, crushed bay leaves or black pepper around impatiens. Mint, cloves, or cayenne pepper may also do the trick. Try spraying area with 50/50 mix of apple cider vinegar and water, which can throw off ants' sense of smell. Some gardeners have noted good results from drawing chalk lines on concrete near plants. Any of these methods may or may not keep ants from your flowers, but they are a safe alternative to ant traps and chemical killers. Next season, locate impatiens away from your house or patio area, to deter ants from eating areas, and coming indoors. With the application of organic deterrents, ants may find a more attractive host than your impatiens over time. But be patient--they probably won't disappear overnight. And conditions in the garden vary somewhat from year to year. Observe the health and well-being of your impatiens as you experiment with conditions, and don't forget to enjoy the process. Sarah Lariviere's debut novel The Bad Kid (Simon & Schuster) is a 2017 Edgar Award finalist. She has taken college courses in landscape design and permaculture, and is an avid gardener.